TODAY contributor Giada De Laurentiis shows how to make delicious frozen treats, such as raspberry ice cream sodas and pomegranate and mint sorbet, to cool off on the hot summer days to come. It’s not very nice to call someone a jerk — unless they work at Soda Jerks on the Santa Monica Pier. A “soda jerk” is an old-fashioned term for a soda fountain tender, whose nickname comes from pulling the arm of a soda draft. 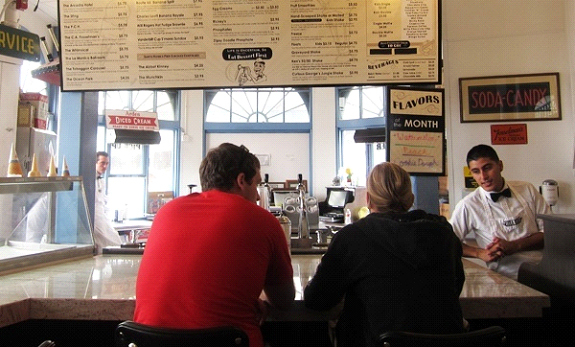 The staff at Soda Jerks wears this name with pride, because most everything about this soda fountain and ice cream shop is a throwback to the 1920s and 1930s. Located in the landmark building that houses the historic carousel (literally right beside it), Soda Jerks has vintage fixtures (the lights came from a 1920s Kansas City saloon) and the soda fountain itself is a refurbished original with a refrigerator case from the ‘40s. Even the candy case dates to the ‘20s, and its drawers are full of novelty candy. But it’s the sundaes you’re after here, served up by soda jerks in white button-down shirts, black bowties and white hats. All of the sundaes — from “the Sting” with toasted almond ice cream, coffee syrup and hot fudge to “the PCH” with rocky road ice cream, marshmallows and chocolate chips — are finished the old-fashioned way: with whipped cream, nuts and a cherry on top. Naturally. From the soda fountain you can order a traditional egg cream or lime rickey, or a “dipsy doodle phosphate” — soda water with orange, cherry and lemon-lime syrups — something that sounds like it’s been cooked up by a mad scientist in a Disney movie. Every detail down to the brand of ice cream seems to fit the period: Fosselman‘s Ice Cream has been around since 1919. And it’s in a Fosselman’s ice cream shop where the owner of Soda Jerks — a third-generation soda jerk himself — got his first taste of the business at the tender age of 16. To Learn more about Soda Jerks feel free to contact us! It has been a long time coming, but we are finally back. Construction has been completed on the Soda Jerks at the Santa Monica Pier. Our new site is located within the historical landmark Carousel building on the Santa Monica Pier and offers a full service soda fountain, sundaes, shakes, malts, ice cream sodas and locally famous Fosselman’s ice cream. Sorry, no food at our new Santa Monica location, just fountain service. To our loyal fans, a warm welcome back and to our first timers, we hope to introduce you to a high quality product in a unique setting. Soda Jerks is a throw back to the 1920’s and 30’s with everything made by hand, including hand pumped Cokes and other traditional fountain service. What better back drop than the historic Carousel building on the Santa Monica Pier. Soda Jerks at the Santa Monica Pier will soon become the best place in Southern California to get a scoop of ice cream. Be sure to check back for updates on our website (which is currently under construction). You can also learn the History of Soda Jerks.